In a game it never trailed, Olympiacos Piraeus got back to its winning habits by downing Besiktas JK Istanbul 77-64 in Peace and Friendship Stadium on Friday night. The defending Turkish Airlines Euroleague champions improve to 1-1 and into a share of fourth place with FC Barcelona Regal in Group F of Top 16, while Besiktas dropped to 0-2. 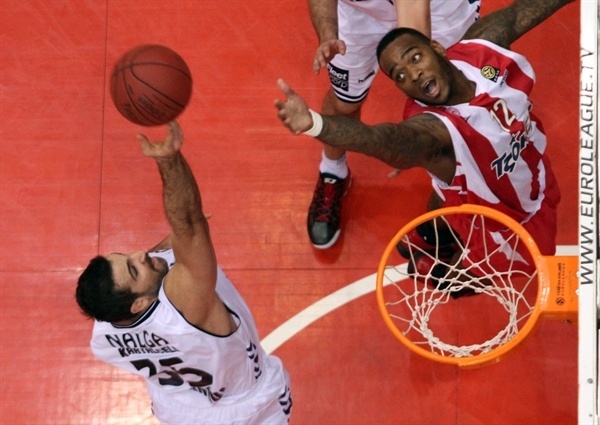 Kostas Sloukas hit 2 key three-pointers to help Olympiacos pull away in the first half. His buzzer-beating triple at the end of the first quarter, and a four-point play midway through the second, were a major contribution in a 16-5 run that gave the hosts control of the game. Back-to-back triples from Vassilis Spanoulis and Georgios Printezis at the start of the third quarter made it a 16-point game as Olympiacos never looked back. 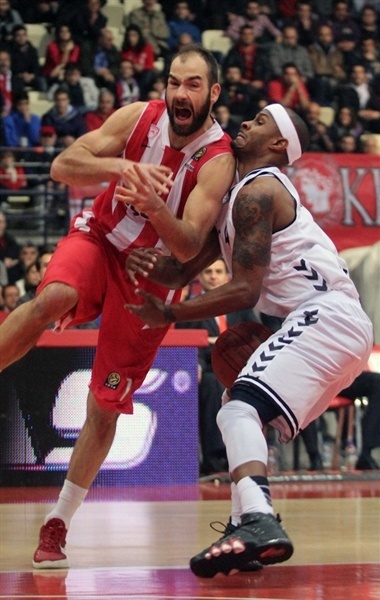 Spanoulis finished with 18 points, while Printezis had 14 in only 19 minutes on the floor. Sloukas contributed with 9 points plus 5 rebounds in victory. 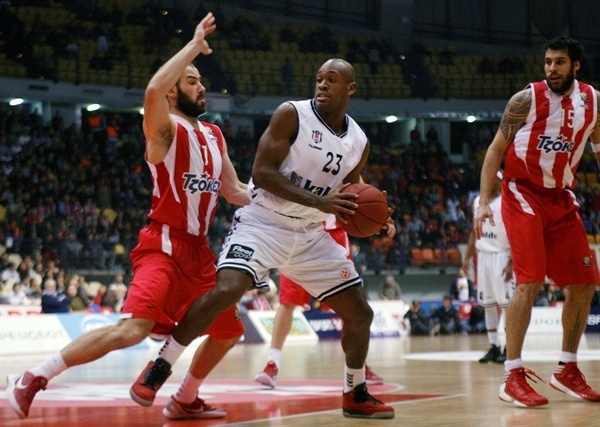 Damir Markota led Besiktas with 14 points plus 10 rebounds, while Daniel Ewing netted 15 and Curtis Jerrells scored 13. 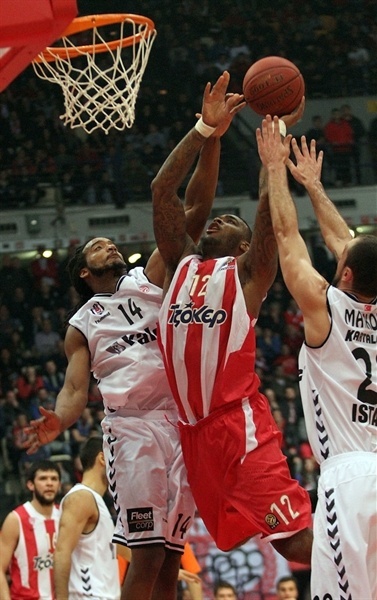 Josh Powell started the scoring for Olympiacos with a tip-in, before Ewing answered on the other end with a layup to open account for Besiktas. 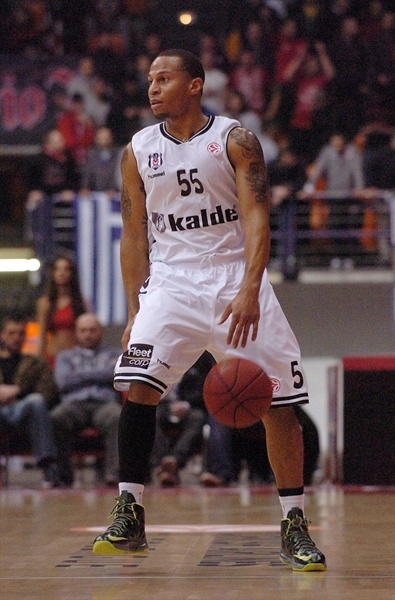 After Spanoulis and Jerrells traded layups, Powell and Printezis scored inside for 9-4. Printezis followed it up with a dunk and a baseline jumper, while Jerrells made basket-plus-foul for the visitors. Stratos Perperoglou hit a long jump shot before Markota and Ewing cut it from the foul line to 15-13. However, in the final 5 seconds of the quarter, Kyle Hines scored in low post before Sloukas forced a turnover then used an inbounds pass to hit a buzzer-beating three-pointer making it 20-13 at the end of the first quarter. 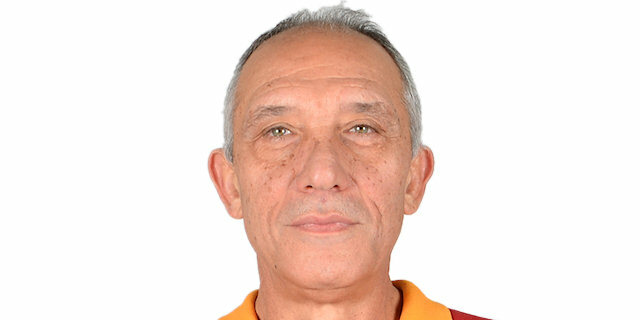 Serhat Cetin opened the second quarter with a three-pointer for the visitors, but Pero Antic replied with a triple of his own. 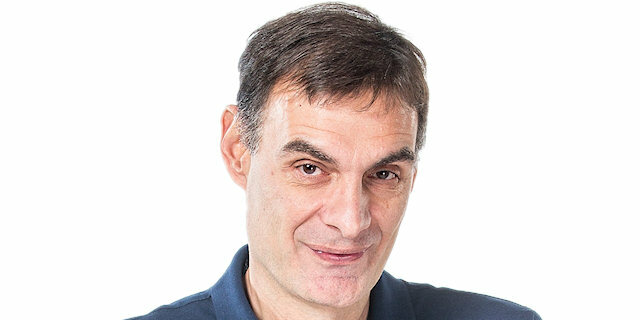 After Jerrells and Acie Law traded layups, Sloukas made a four-point play – sinking a triple while drawing a foul – to extend the lead to 29-20, and another layup by Law made it an 11-point affair. Muratcan Guler and Ewing made baskets inside before Fikret Can Akin hit a jumper for the visitors, however, Olympiacos made 4 of 6 free throws to keep the margin in double figures, and went into halftime holding a 37-27 advantage. Spanoulis and Printezis hit back-to-back three-pointers to start the third quarter. Besiktas went inside to Cemal Nalga for his first bucket of the night, and that started a 2-9 run. Jerrells and Cetin added layups, and Markota hit from long range to cut the deficit to 45-38. Spanoulis answered with a triple of his own, but Markota made another three, this one from the right corner with a help of the glass, making it a 7-point game again. However, Printezis drove baseline for a dunk, then followed it up with a shot from behind the arc, before Kostas Papanikolaou drove for a layup and 55-41. Before the quarter’s end, Markota added a layup to his tally and Patrick Christopher converted 3 free throws to cut it to 57-46 after three quarters. It took 3 minutes for the first field goal of the fourth quarter, and Guler’s basket-plus-foul made it 59-49. On the other end, Hines hustled for an offensive rebound and later finished the possession with a dunk. Ewing replied with a layup, but it was Hines again who scored from close range, this time from Spanoulis’s assist, extending the lead to 65-51. Randal Falker then scored twice inside for the visitors, but Spanoulis made all his free throws and also assisted Law on a fastbreak reverse layup making it 75-57 entering the final minute. Before the end of the game, Ewing hit a triple and a pair of free throws to round out the scoring and help Besiktas finish the game on a 2-7 run. "It was the first home game in the Top 16 and I like the atmosphere created by our fans. Besiktas is a good and well-coached team that never gives up. We had a defensive plan to stop Christopher, Ewing and Jerrells and we did it well. In offense we had a medium game, this is the reason we failed to finish the game earlier. However the victory is important and now we have to get prepared to play away versus Barcelona. Caja Laboral beat Maccabi on the road, but it is too early to have a clear situation and make conclusions. Caja Laboral, Montepaschi Siena and BC Khimki have already won on the road and they have an advantage. 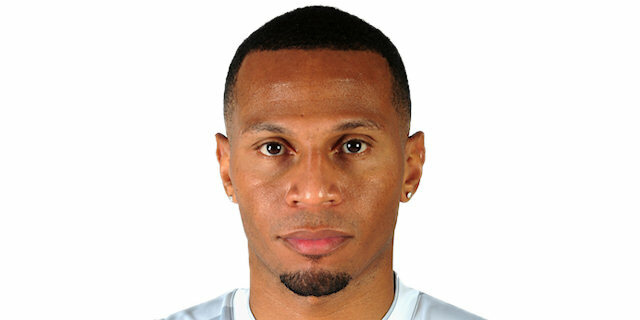 I think that if Olympiacos plays its usual way, we are able to win everywhere, as we proved during the regular season." "We are still making the same mistakes we made in the regular season. This is crazy and we have to work hard and try to fix it immediately. It is positive that we came back to the game, but a bigger effort is needed to win. Vidmar was injured and it was not a proper game to risk his participation." "It was not an easy win. We had pressure in shooting the ball well, but the result is positive and we are looking forward to playing much better, especially in offense. Now we have to play three difficult games versus Barcelona, Montepaschi Siena and Maccabi Tel Aviv and I hope we get the wins needed in order to make it to the playoffs. " 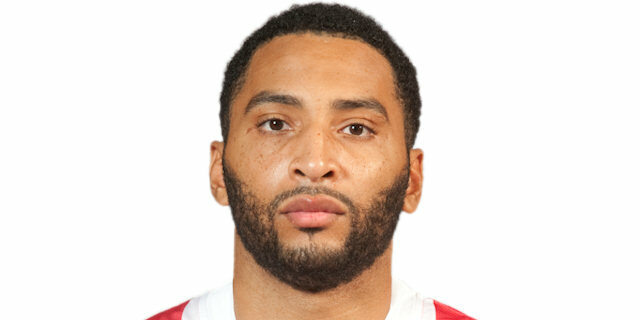 "The defense of Olympiacos didn’t allow us to play to our usual offensive standards. They played great defense, no doubt. Spanoulis scored as usual and they deserved to win. Now we are 0-2, but the road is long and we have to keep fighting."